While many tourists flock to big cities of Tokyo and Osaka every year, nature lovers know that the largest region of Japan, Hokkaido, is the place to go for unspoiled natural beauty, incredible food and the best snow in Japan. Not sure when you can make it out to Hokkaido? Here are twelve events worth checking out, one for each month of the year. January in Hokkaido is a powdery paradise and certainly not for those afraid of the cold. Since the ski slopes of Niseko are crowded in January, why not kick back and relax at the one-of-a-kind Ice Village on the slopes of Mount Tomamu. When the weather is cold enough, this charming winter wonderland becomes open to the public, and for a limited time, the Ice Hotel becomes available to guests staying at the Hoshino Resorts Tomamu hotel. Allowing only one group of guests per day (a maximum of two people per party), the Ice Hotel offers the chance to literally chill in nature with a room and furniture completely made from ice. 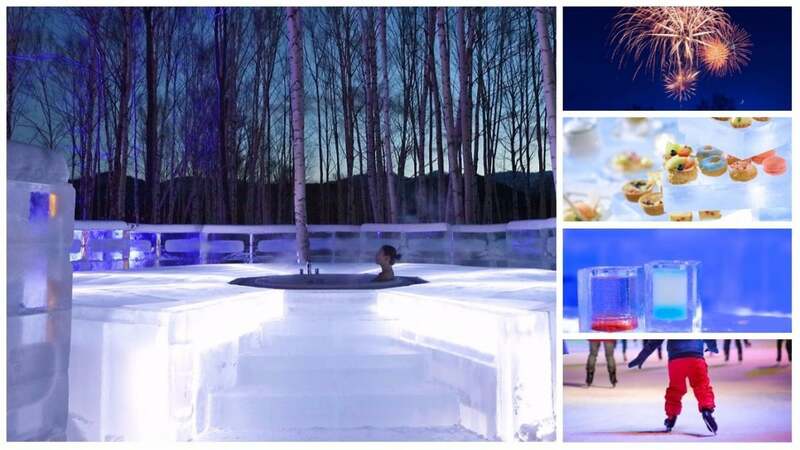 The room comes with an ice bed, table, sofa and the incredibly elegant "Infinity Bath," an outdoor bath that's completely surrounded by white birch trees. In 2017, the Ice Hotel hours were listed from 5 p.m. to 10 p.m. for visiting, free for all guests, and from 11 p.m. to 8 a.m. the next day for those staying overnight. The hotel was open to guests staying at the Hoshino Resort from January 14 to February 28. Federal law mandates that guests have a room reserved at the regular hotel in order to book the Ice Hotel for a night (in the instance of any issues with the ice accommodation, such as a sudden increase in temperature, or if the guest gets "cold feet" and has to retreat to the warm resort. Reserving the Ice Hotel will cost ¥20,000 (US$176.40) per person on top of the regular hotel fee, but the unique experience also comes with access to all the Ice Village activities, including ice skating, access to the Bar Icewood, a tasty tea party, or even witness a wedding in the ice chapel followed by a phenomenal fireworks show! One of the biggest annual festivals in Sapporo, and in Japan as a whole, the Sapporo Snow Festival draws people far and wide to the capital city of Hokkaido Prefecture for fun in the snow. Starting in 1950, the festivities are held across three main sites: Odori Park, the Sapporo Community Dome and Susukino. Odori Park is where you'll find the largest of the displays, the colossal statues made purely from snow and ice. While fan favorites are scenes from popular movies and anime, often on offer are replicas of famous buildings from around the world, like India's Taj Mahal or Taipei's Chiang Kai-shek Memorial Hall (pictured above). The festival will be held from February 5 to 11 in 2018. When the mulled spice wine isn't cutting it anymore and you've had your fill of snow, fill up on snow crab! Be sure to find one of the many restaurants in the area offering an all-you-can-eat crab dinner. Of course, these deals are possible year-round, but we think the combination of snow festival and snow crab is definitely one worth mentioning. If you fell in love with the hit 2005 movie March of the Penguins, then you need to run, not waddle, to Asahiyama Zoo, in Asahikawa City, this winter to see them move in real life. Technically not a march, this popular parade is the daily exercise for the penguins, though it's remarkable how the untrained birds manage to walk in polite lines between the two zookeepers. While the official dates are dependent on the condition of the birds, you can typically enjoy this spectacle from mid-December to mid-March (obviously we particularly liked the wordplay with March). Twice a day at 11 a.m. and 2:30 p.m (only once a day in March when the weather is a little warmer), you can see the penguin procession as the tuxedoed birds walk off some of their winter weight. However, please understand that the times are purely at the zoo's discretion and may be canceled due to inclement weather or other factors preventing the walk. If you plan to go out there, keep an eye on the zoo's website (below) on the morning before your visit to avoid disappointment. May 5 in Japan is known as Children's Day, a holiday that celebrates the happiness and wellbeing of children. One clear symbol of the holiday is the koinobori (carp flag), which are flown at homes to represent each member of the family. According to Chinese legend, carp that endure a tough swim upstream can become dragons, therefore it's a symbol of aspiration for the children to be strong when they grow up and overcome any obstacle they face. Though May 5 is the official holiday, from April 15 in Jozankei, one of Hokkaido's most popular hot spring areas, you can see around 350 koinobori fluttering in the breeze. The event, called Jozankei Onsen Keiryu Koinobori, started in 1986 and it's a spectacular sight to see the fish "swimming" in the sky between buildings, over the stream and near the hot springs for which the area is known. Goryokaku Fort may have begun as a fortification full of cannons and other war weapons, but now it's better known for its cherry blossoms. Shaped like a five-pointed star, Goryokaku was the scene of the final battle of the Boshin War (1868-1869), which led to the beginning of the Meiji Restoration. The site is a stunning park full of sakura and listed as a Special Historical Site. Sakura blossom later in Hokkaido than the majority of Japan, so if you missed them in Tokyo or Kyoto, you've got one last chance to catch these fleeting blooms in Hakodate. Also, if you can swing by on the third weekend of May, you'll be treated to the Goryokaku Festival. This festival commemorates the end of the Boshin War with a parade featuring 1,000 revelers dressed as warriors, re-enacting some of the battle scenes. If you've ever been to a Japanese festival, perhaps you've seen Yosakoi dancers. Yosakoi is a modernization of traditional Japanese festival dances, such as Awa Odori, and about 30,000 participants in large teams come out to Hokkaido every summer to celebrate the warmth finally coming to the chilly island. The Yosakoi Soran Festival was first held in 1992 and has grown into one of the largest in the nation. While there are various performances held around the city, Odori Park is the main venue. If you can make it out to Sapporo in early June for the festivities, there are many ways to get involved, from joining a dance troupe and getting on-stage to cheering from the sidelines with your own naruko hand clappers. And when you need a break from the summer spectacle, make sure you try the delicious festival food! Top 5 Winter Illuminations Outside of Tokyo! Actor, director and writer calling Japan home for the past seven years. Lover of the stage and all things Final Fantasy. Hobbies include drawing, gym, and cooking (but not simultaneously).